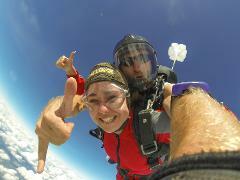 Grab our 16,500 FT Gold package and enjoy 70seconds of freefall! All while your talented tandem instructor takes both video and photos of your experience. Grab our 16,500 FT Silver package and enjoy 70seconds of freefall! All while your talented tandem instructor take photos of your experience. Our 16,500 FT Platinum package includes every camera style that we offer brilliantly merged together. All taken while freefalling up to 200km per hour for 70seconds over the breathtaking Bay of Islands. Grab our 12,000 FT Silver package and enjoy 45seconds of freefall! All while your talented tandem instructor takes photos of your experience. Grab our 12,000 FT Gold package and enjoy 45 seconds of freefall! All while your talented tandem instructor takes both video and photos of your experience. Our 12,000 FT Platinum package includes every camera style that we offer brilliantly merged together. 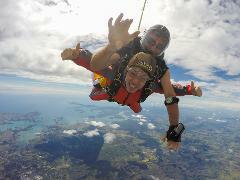 All taken while freefalling up to 200km per hour for 45 seconds over the breathtaking Bay of Islands. Grab our 9,000 FT Silver package and enjoy 20seconds of freefall! All while your talented tandem instructor takes photos of your experience. 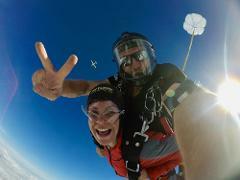 Grab our 9,000 FT Gold package and enjoy 20seconds of freefall! All while your talented tandem instructor take video and photos of your experience. Our 9,000 FT Platinum package includes every camera style that we offer brilliantly merged together. 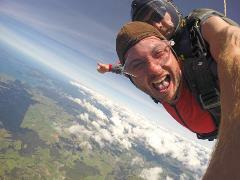 All taken while freefalling up to 200km per hour for 20seconds over the breathtaking Bay of Islands. Grab our 20,000FT Silver package and experience our altitude jump, flying from up to 20,000ft enjoy 85 seconds of freefall! All while your talented tandem instructor takes photos of your experience. Our brand new high altitude jump - It’s out of this world Take it to the limit with our mind-blowing 20,000ft altitude jump and you’ll be one of an elite few all while your talented tandem instructor take video & photos of your experience. Our brand new high altitude jump - It’s out of this world! Take it to the limit with our mind-blowing 20,000ft altitude jump, All while your talented tandem instructor and one of our camera flyers take video & photos of your experience.